When I moved to Pennsylvania in 1998, I boarded at a facility with six miles of trails. Those trails went onto adjacent properties and our enjoyment was made possible by the farm's neighbors, who permitted us to ride on the perimeter of their land. No one took their generosity for granted. 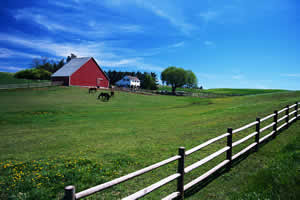 Now, years later, much of that farmland has been developed, and even the boarding barn has sold off land to developers. What can be done to preserve our open spaces and rural areas? Well, I know that organizations like the Nature Conservancy and other land trusts sometimes buy land at its fair market value, and that local and state governments have land preservation programs for properties that meet certain criteria. But only recently have I tried to deepen my understanding. Here is a bit of basic information on one tool for protecting undeveloped open spaces: conservation easements. If there is interest, I'll write more on this topic. What does it mean to own land? Land ownership can be described as a "bundle of rights." It's possible to "unbundle" the rights of land ownership and sell or donate certain rights to other entities like government agencies. A land owner can sell mineral rights to a property, for example, while retaining all other ownership rights. Easements are voluntarily sold or donated by the landowner to either a trust or government agency. They generally have no time limit (are held in perpetuity). The owner must still pay taxes, maintain the land, etc. Public access to the land may or may not be a part of an easement. There may be tax advantages to owning land with an easement. In fact, the U.S. Congress recently passed a law that considerably increased the tax incentives for people considering donating conservation easements. Agricultural easements prohibit the sale or use of the land for industrial or residential development. Agricultural easements can benefit the equestrian community. 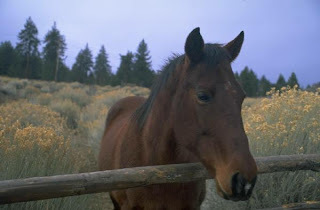 Landowners can specify that their property be available for equestrian use. Easements can be written to include language granting an equestrian organization such as a trails association or riding club and, in some instances, a government or conservation organization, the right to use land for equestrian activities. Conservation easements can permit general equestrian use or even require that the land be kept open for specified equestrian activity. The Equestrian Land Conservation Resource has prepared a publication called Easement Guide for Equestrian Use. It's a unique and relevant guide for anyone interested in preserving land for equestrian activities. Here are some resources on preserving land for equestrian use. This group provides equestrian activitists with the knowledge and tools to advocate for preserving land for equestrian use. Great information. I am very worried about the loss of trails. Very interesting subject! Working as urban planner and also rider I came across this problem both in my profession and hobby. Here in portugal we are having the same problems... and this info is perfect for start discussing the problem. I am very fortunate to live on 300 acres so I have my own private riding paradise for my horses and our land also connects to many other acres of trails as well. But I am very aware not many people live the kind of rural life we do. We are concerned about development and growth and are doing all in our power to protect our land for future generations. Thank you for pointing your readers to valuable resources and making them aware of a growing problem.